‘The Grove’ in Harborne, Birmingham, was designed in 1877–78 by John Henry Chamberlain for William Kenrick, a prominent Birmingham businessman. The anteroom of the drawing room, which was acquired by the V&A just before the house was demolished, reflects the mixed classical and Gothic elements of the Aesthetic style. It is richly decorated with inlaid, painted and gilded wood. The room was used to display Kendrick’s collection of blue and white ceramics. The whole room, with the exception of the marble fireplace, is panelled in sycamore and oak, with inlay of walnut and other woods. The mirror surround is gilded as is the background to the curved frieze, painted with a naturalistic design of apple blossom and birds. This room, originally called the Ante Room, was designed by the architect, J.H. Chamberlain, for The Grove, Harborne, the house he rebuilt for William Kenrick, a local industrialist and M.P. 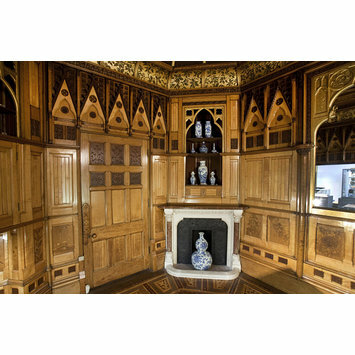 The room was probably made in the workshop of Samuel Barfield, a skilled woodcarver who frequently worked for Chamberlain. 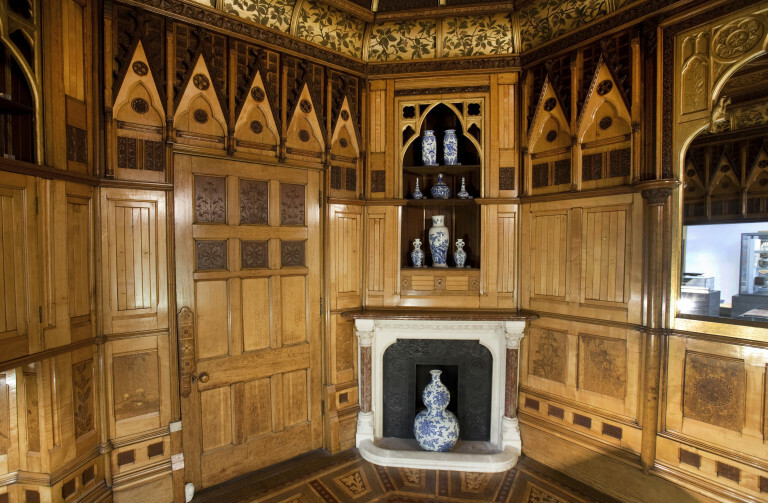 Chamberlain, a keen collector of pottery and porcelain, displayed some of his collection in the room which was used as a route from the hall to the drawing room. By 1911, when an Inventory was drawn up for William Kenrick, the room was called the Boudoir and the furniture, listed on page 20 of the Inventory, included a settee covered in plush with woven panels, two armchairs of different design with similar covers, a second settee, three tables and a stool. The corner of the room with the fireplace, door, part of the right hand wall and corner of the first settee are shown in a photograph of the Boudoir in the Inventory, page 16. The porcelain and pottery in the Boudoir are listed in the Inventory, pp. 40-43. The Inventory & Valuation was drawn up for Kenrick by Waring & Gillow Ltd in 1911 (original Birmingham City Archives MS 400/93). Two copies of this Inventory, one with illustrations, are in the relevant Buildings file, Information Section, Department of Furniture, Textiles and Fashion. In 1962 John Hayward of the Department of Woodwork and Barbara Morris of the Department of Circulation were invited to inspect The Grove by Birmingham Museum as the house and grounds had been bequeathed to the City Council. The Ante-Room was removed by the Museum for display before the house was demolished. The room was installed in the Victorian Primary Gallery and opened to the public in June 1967. An oak centre table (possibly with a later top), designed by Chamberlain for the hallway of The Grove and made by Collier & Plucknett, Warwick, was previously owned by The Fine Art Society and sold by Gorringe's, Lewes, East Sussex, 26 Sept. 2017, lot 591.